Taking place later this month at Jack Bell Gallery is a vibrant exhibition of work by photographer Leonce Raphael Agbodjelou that explores his native tradition of Egungun: a religious festival among the Yoruba of Nigeria whose main aim is to appease dead spirits. Dating back to the 11th and 14th centuries AD, the masqueraders appear at funerals to mark and guide the passage of the deceased to the spirit world. Dressed in elaborate masks made out of layers of vibrant textiles, through drumming and dance these robed performers occupy a range of roles that vary from recent deceased and historical forbears, to acting as community executioners of criminals and witches. Whilst annual festivals are held in Yoruba-speaking communities at the beginning of the rainy season to cleanse the town, Egungun can also appear at any time to avert major misfortune or affliction that threaten the local community. To coincide with Halloween, our annual festival of the dead, we speak to Agbodjelou about his local Egungun tradition and his various encounters whilst working on the project. 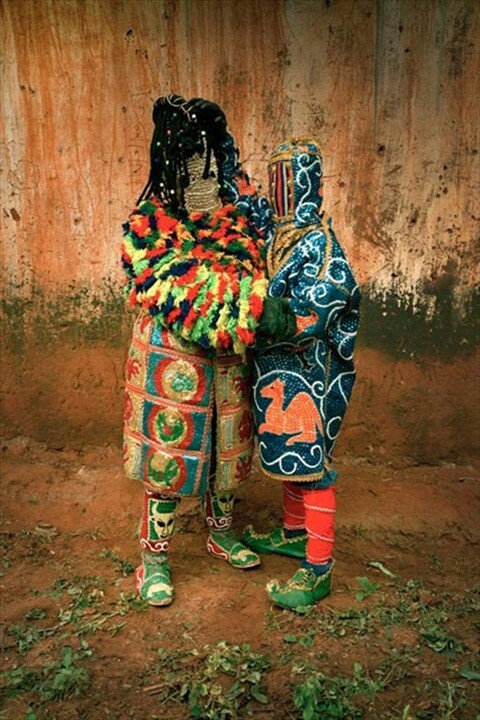 What drew you to focus on the subject of Egungun masqueraders? Egungun masqueraders are a part of my local culture. For me, the Egungun use public performance to tap into a narrative of localised Yoruba memories, personalised histories and ritual. They play a fundamental role in upholding the ethical values of the community. Describe your photographic technique for this series? I have quite a traditional method of working having been trained by my father (the world-renowned Joseph Moise Agbodjelou). But since then I’ve developed my own individual style, which speaks to a contemporary audience. I shoot with medium format in an outdoor studio. I’m always thinking about the essential components of portrait photography—light, subject, framing. These portraits capture both the individual personalities and quirks of the Egungun while marking out their power and elusiveness as liminal visitors from the world of the dead. What was the most interesting thing you discovered through this project? I think what interested me the most about these performances were the dynamic tensions that occur between this world and the next. My individual portraits of Egungun try to confront this “betwixt and between” quality, as ancestral visitors are temporarily made manifest to aid and guide the lineages to which they belong. What does it feel like to witness the Egungun masqueraders’ ritualistic dances and performances? It’s quite amazing to see the range of roles they occupy. Visually alone the performances are spectacular – miracle workers, acrobats and figures adorned with incredible textiles and costumes all combine to entertain the onlookers with magical feats and a real sumptuousness of display. What are your thoughts towards the Pentecostal churches demonisation of this form of religion? Since the 1990s the rise of Pentecostal churches across West Africa has been a new challenge to Egungun masquerade. The churches sought to represent indigenous religions and their pantheons of deities as pagan and dangerous. However, rather than suffering rejection, the Egungun have responded in elaborating counter-narratives which have succeeded in keeping this important practice relevant to contemporary audiences. How would you sum up this series? These portraits capture both the individual personalities and quirks of the Egungun while marking out their power and elusiveness as liminal visitors from the world of the dead. Egungun Project by Leonce Raphael Agbodjelou takes place at Jack Bell Gallery from November 17 – December 17.